Ambitious student Lauren Mason, from Dunfermline, is no stranger to taking the initiative. 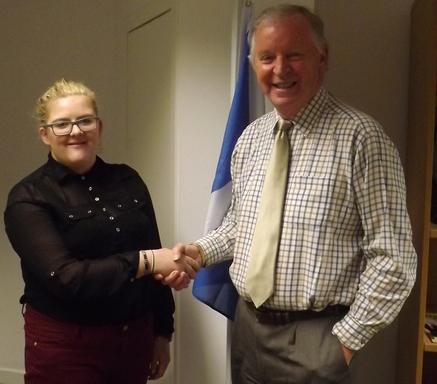 After spending the last 12 months volunteering as an intern for MSP Bill Walker, the self-motivated 17-year old is now opting to spend her summer holidays taking a Social Sciences course in Aberdeen—in preparation for a degree in Politics and International Relations. Lauren, who has just completed sixth-year at St Columba’s High School, contacted Mr Walker in June 2011 when he was elected to Holyrood. Undeterred that the new MSP had not yet set up his constituency office, hard-working Lauren volunteered to begin her internship working from a laptop at the kitchen table of Mr Walker’s PA. Throughout the summer holidays of 2011, Lauren played a key role in getting the Dunfermline office up and running, and she continued volunteering each week after returning to school. Lauren said: “I am so grateful for the opportunity that Bill and the team have given me. My internship has fuelled my passion for politics even more. After wishing Lauren the best of luck for her studies, Mr Walker said: “Lauren is a very cheerful and pleasant young woman with boundless enthusiasm and motivation. She is absolutely determined to do well, and she is a real credit to her family and St Columba’s. “It has been wonderful to have her working with us. I was glad to offer her the opportunity to get some work experience and am very grateful for her contribution and dedication. After summer school, Lauren plans to spend the next four years at Aberdeen University studying for her degree. Afterwards, she hopes to become a Modern Studies teacher or enter a career in politics.